The French have a term, "film maudit," for "cursed" films, by which they and film buffs everywhere mean those movies that suffer from difficult productions and/or box office rejection. By some standards, Andrew Stanton's John Carter qualifies as a film maudit because of the critical drubbing it's received and the abysmal losses it now represents for the Disney company. However, if we were to consider George Melford's The Viking a film maudit, few other films would merit the label. This early Canadian talkie may be the ultimate film maudit, not just for the horrific circumstances that ended the production, but for the way the film itself seems in retrospect to court doom. It was released in the summer of 1931, its title changed from "White Thunder" in an act of ghoulish exploitation. The Viking was the name of the vessel, a real working ship, that took cast and crew to the Labrador ice fields to film the seal hunts on the ice. After a preview of "White Thunder" played poorly, producer Varick Frissell ventured back to Labrador (without Melford, as far as I know) to shoot more actuality action scenes. On that trip, the explosives kept in store for ice breaking blew up on board, killing Frissell, his cinematographer and two dozen others. The story is told in a preface to the picture proper, following a title card that fairly identifies the event as the greatest catastrophe in the history of motion pictures. It so happens that The Viking is a film about a hero considered a jinx -- or "jinker" in the local slang -- who sails with the title vessel against the will of a captain who boasts that he's never lost a man on any expedition. That actor was the real captain of the Viking during the initial filming. He didn't sail on the fatal return trip, but his mate did, and died. This awful backstory makes Melford's film even more breathtaking than it would have been otherwise. It's the last of three extraordinary films that I know of in the director's filmography, the others being that seminal romantic abduction fantasy The Shiek, and Universal's Spanish-language version of Dracula, which like The Viking was considered a lost film for many years before rediscovery. Like the "Spanish Dracula," The Viking leaves you wondering what Melford contributed to the visuals. Was he or Frissell the auteur of the piece? Whose eye -- or should doomed cinematographer Alexander Gustavus Penrod get the credi? -- captured the awesome images -- probably still irreproducible even with today's CGI -- of the vast rippling, pitching icescapes of the seal hunts, a white world in perpetual tumult, a rollercoaster on a continental scale? Who could not record pictorial wonders in such a setting? You have to wonder because the dramatic scenes before and after the expedition are nothing special, and those are the parts most certainly directed by Melford. Nor is the script by Garnett Weston that special. At its core it echoes The Four Feathers. A despised young man (future Durango Kid Charles Starrett), condemned for weakness if not cowardice and stigmatized as a jinker, proves himself by rescuing a sometimes-hostile acquaintance who's temporarily blinded. This human story is really a sideshow or subplot compared to the amazing actuality footage, which includes a seal hunt that offers a sop to animal lovers. We're supposed to identify with the hunters and their dangerous quest for wealth, but once they catch up with the seal herd and the shots start firing, Melford (or Frissell) cuts to a baby seal bleating helplessly by itself, too young or too frightened to know what to do to save itself. An older seal -- the baby's parent or just a conscientious seal citizen? -- lurches back onto the ice to steer and shove the baby to the shelter of the water. As the shots keep ringing out, the scene fades out on the baby's face peeking through the surface, presumably safe but plainly terrified. The individual's survival obscures the collective massacre, but I can imagine some selectively sensitive people feeling that Frissell and company got what they deserved later. Varick Frissell was a disciple of Robert Flaherty, the pioneer documentarian and arguable forefather of "reality TV" who combined actuality with dramatization. The Viking's semidocumentary nature strikes me as preminiscent of today's "dangerous job" programs like Deadliest Catch, some of which have lost cast members in real-life accidents. Somehow I find The Viking's foregrounding of acknowledged fiction more honest than the modern pretense of many "unscripted" programs. Back in 1931, I think everyone understood that the story was the necessary excuse for the good footage that actually dominates the film and makes it memorable today. Whoever shot it or shaped it, that footage is so impressive that it'd impress people who have no clue of the fate of the ship and its crew. I'd like to think it'd impress people accustomed even to color and CGI and 3D today. The Viking proves that truth can still be more fantastic than fantasy. If you missed the TCM broadcast of March 30, The Viking can be seen in its entirety on YouTube. In 2009 Leisure Books, one of the leading publishers of paperback westerns, issued "The Classic Film Collection" of novels that had inspired great western movies. Titles included Max Brand's venerable Destry Rides Again, T.T. Flynn's The Man From Laramie, Forrest Carter's Gone to Texas (filmed as The Outlaw Josey Wales) and two by Alan Le May. The Unforgiven was filmed by John Huston with Burt Lancaster, Audrey Hepburn and Audie Murphy in 1960. Four years earlier, John Ford had made Le May's The Searchers into a film widely regarded as the greatest of all western movies. The film's reputation made the novel worth a read. It would at least be interesting to see how much Ford and his screenwriter, Frank S. Nugent, deviated from the original text, and whether the book could stand comparisons to the film. The first thing a reader notices is that Le May starts his novel at approximately the 14-minute mark of the movie. He opens with Aaron Edwards noticing suspicious signs near his homestead while his visiting brother rides with Martin Pauley and the locals in search of cattle thieves. He cuts from the Edwards homestead to the men on the trail and back, until the family sends little Debbie out back to hide near Grandma's grave. Le May does not show an Indian discovering the girl and blowing a horn. For the moment, Debbie's fate is even more mysterious than in the movie. But the important fact for comparison's sake is that the first scenes of the Searchers movie are complete inventions of Ford and Nugent. What do they add to Le May's story? Some people may know that Aaron Edwards's vengeful brother is called Amos, not Ethan, in the novel. The change seems like one of those infuriatingly arbitrary Hollywood decisions, though you might speculate that Ford liked the alliterative sound of "Ethan Edwards" better, or that he thought the name Amos too evocative of Amos n' Andy to be taken seriously. There are a lot of arbitrary changes for the film. The novel's Mose Harper is a garrulous old man with grown sons, a bit of a bore when he bloviates about the past but neither crazy nor stupid by any means. But there's a character named Lije Powers who becomes more important late in the story and wants no more payment for his help in the search than to have a bunk to sleep in for the rest of his life -- and a rocking chair. Ford and Nugent merge the two characters into a personality suited to stock-company stalwart Hank Worden. The neighbor family to the Edwardses is the Mathisons in the novel. Ford makes them the Jorgensons for no better reason than for John Qualen to do his Swedish accent. Qualen could do perfectly well without the accent; his greatest performance, arguably, is done without it in The Grapes of Wrath and was directed by John Ford. But one suspects that Qualen's Swede schtik makes The Searchers more superficially Fordian, as does the expansion of a Texas Ranger commander's role to suit the bluster of Ward Bond. But the transformation of Amos into Ethan Edwards is more than superficial, more than Fordian gimmickry. Amos Edwards "had served two years with the Rangers,and four under Hood, and had twice been up the Chisholm Trail. Earlier he had done other things -- bossed a bull train, packed the mail, captained a stage station -- and he had done all of them well. Nobody exactly understood why he always drifted back, sooner or later, to work for his younger brother, with never any understanding as to pay." He is prone to "deadlocks" that may explain his restlessness. Such a deadlock leaves him torn between rushing back to Aaron's land once convinced that the raiders may strike there and continuing with the chase of the presumed cattle thieves lest he seem a coward to the other men. But this is only what Martin Pauley assumes. In the novel, Amos is seen entirely through Martin's eyes. The novel itself is Martin's story more than anyone else's. The film is Ethan's. That's why Ford shows him arriving at Aaron's place and establishes his relationships with the people there, from the three-way tension with Aaron and his wife Martha to his casual hoisting of little Debbie into the air. If the novel always shows us Martin watching Amos, the film strives for balance, giving us Ethan's perspective as well as Martin's. The film is full of powerful reaction shots of John Wayne's Ethan as he despairs or seethes with rage or gazes with revulsion at some new horror. The part probably had to grow to fit Wayne's stardom, but as is well known, Ethan Edwards is someone quite different from the typical John Wayne hero role. If Le May presents an existentially indecisive Amos, tormented by his failure to claim the woman he loved, who dies his brother's wife, Ford gives us an all-too decisive Ethan. The mystery about Ethan Edwards isn't why he never sticks with any job, but whether he's robbed a bank or a train. Ethan's problem isn't indecision; it's an irreconcilable nature that doesn't believe in surrendering (he professes continued loyalty to the defunct Confederacy) and doesn't accept contradiction. His relationship with Martin has sharper edges. In the novel, Martin is described as dark, but he doesn't appear to have as much Indian blood, if any, as the movie Martin. He bristles in the book when someone says he looks like a half-breed. In the movie, his mixed ancestry gives Ethan reason to despise him. Much of their banter is carried over verbatim from book to film, but it comes across meaner in the movie. Partly that's because the movie Martin is a much weaker character than the original. Ford and Nugent make him much more of a tenderfoot than he is in the novel. While Martin is clueless in the picture about Ethan's intention to use him as bait to lure Jerem Futterman into an ambush, in the novel he argues with Amos about how much of a dumb "old flim-flam" the idea is. If the movie Martin is more naive, Ethan is more masterful than Amos. In the movie, he shoots down a Ranger's idea of stampeding the ponies of the murder band by noting the old Comanche trick of sleeping tied to your fastest pony. In the novel, stampeding the ponies is Amos's idea, and it's shot down by Charlie MacCorry (portrayed as an imbecile in the movie). As the difference in skill and power appears more vast in the movie, so Ethan appears more intimidating to Martin and the audience. Make no mistake: Amos Edwards is as much of a menace as Ethan as far as a grown-up Debbie is concerned. Amos is just as ready to destroy her rather than see her degraded as a squaw, but his attitude is taken as a given, explained only by Martin's speculation about the man's grief over the woman he loved but never had. His attitude doesn't even seem to be exceptional: Laurie Mathison tells Martin that killing the adult Debbie would be the right thing to do and something her mother would have approved. But because Ethan Edwards is the central character of the Searchers movie, Ford feels a need to explain the depths of Ethan's hatred. He had Nugent write an original scene, one of the most controversial scenes in the picture, in which Ethan and Martin inspect some white women liberated from Indian captivity. They appear to have been driven mad or retarded in their mental development. Their behavior is infantile or subhuman. And Ford makes sure with a dolly shot moving in for a close-up that we see Ethan take it all in and let it stew in his mind. Ford shows us what Ethan is thinking in a way Le May never directly shows us Amos thinking. Ford's Searchers is recognized as a critique of one man's racism but also widely viewed as itself racist given scenes like that one. How racist the film really is might be measured by comparing it with the novel. The savagery of Indians is more of an overriding topic of Le May's novel. Le May's racism isn't genocidal, but it is judgmental. He attributes to Native Americans the classic characteristics of the savage enemy or "unlawful combatant." They abuse the good will of naive humanitarians. They push the envelope constantly to see what they can get away with before the military cracks down. Above all, they lie and lie and lie. The author's viewpoint, as best as I can tell, is that they need to be tamed, not exterminated. His characters see things differently. "Look," Martin's accidental Indian wife, is one Native character treated with more respect in Le May's novel than in Ford's film -- but Ford milks her demise for more pathos and more outrage against his usually irreproachable U.S. Cavalry. "I see something now....I never used to understand. I see now why the Comanches murder our women when they raid -- brain our babies, even -- what ones they don't pick to steal. It's so we won't breed. They want us off the earth. I understand that, because that's what I want for them. I want them dead. All of them. I want them cleaned off the face of the world." The speaker is Martin Pauley, and what provoked this wasn't some fresh massacre or any act of violence. His comments to Charlie MacCorry come after he has finally found Debbie and she has urged him to go away. It's a much more protracted scene than in the movie, and the gist of it is that Chief Scar's Comanches have brainwashed Debbie. They've convinced her that Scar rescued her after other Indians or white rustlers killed her family. They have her believing that all white people lie. This concern with brainwashing or indoctrination, on top of Le May's contemptuous account of all attempts to appease the Indians, gives the Searchers novel a sort of Cold War quality, with the Comanches standing in as much for Communists as for archetypal savages. Stories of Indian captivity probably seemed especially relevant at a time when "Better Dead Than Red" was a watchword. Indian stories probably gave Cold War audiences a politically safe way to ask and answer whether dead was better than red after all, though The Searchers leaves open a none-of-the-above option. For the record, the novel allows readers to believe that Debbie may still be a virgin when the heroes find her. Scar is her "father," not her husband, and is unwilling to trade for her because he's already arranged a marriage for her that will net him a fortune in horses, and reneging will cost him face in his tribe. The movie, meanwhile, never refutes the assumption that Debbie has been "living with a buck," and thus states more firmly that it could never be too late to rescue her. "Better Dead Than Red" in the other sense of red is not an option in the film. In any event, for both book and film it might be helpful to distinguish between racism and bigotry. That distinction might also help us resolve the apparent contradictions in the film. A story might be racist while indicting bigotry if the latter is defined as an individual's irrational hatred while the former merely presupposes superiority, inferiority, conflict and conquest. More so, arguably, than Amos, Ethan is a bigot. Hatred is a personal issue that he has to overcome. In Ford's film, that overcoming becomes the central dramatic event, more important than whether Debbie is ever found since, if he doesn't overcome himself, Debbie will surely die. Ford's build-up to the big reveal of Natalie Wood as the grown Debbie is something film can just do better than writing. Max Steiner's outstanding score helps a lot. The stakes aren't that high in the novel. The biggest departure the film makes from the novel, after all, is that Ethan spares Debbie. In the novel, Amos never gets the chance. After a much more elaborate battle scene than in the movie, Amos prepares to ride down a fleeing squaw he presumes to be Debbie while Martin calls out for him to stop and actually takes a shot at him. At the last moment, Amos simply grabs the girl -- at which point she reveals herself as a Comanche and shoots him to death at point blank range. It's up to Martin to find Debbie wandering in the desert well after the battle, with the slightest closing hint that they might form a couple later. Martin is available because, in the novel, Laurie Mathison marries Charlie MacCorry after all -- you couldn't expect her to wait forever, could you? The end of the novel can't help but seem anticlimactic in light of the movie because Le May doesn't really give us a redemptive moment. We do not see Amos overcoming his hatred -- he may simply have had one last deadlock of indecision and paid for it. In the film, however, Ford has prepared us for the supreme moment from the start, from the early shot when Ethan hoists little Debbie in the air. When he lifts Natalie Wood's adult Debbie the same way, our memory of the earlier scene allows us to assume a similar memory at work in Ethan himself. She is the child once more, not the squaw. But Ford's famous finale, in which Ethan turns and walks away instead of joining the big reunion at the Jorgenson place, could be his act of fidelity to the novel, his admission that the Edwards character has been destroyed by his quest after all, despite his apparent redemption, reduced to walking between the winds like a living ghost -- as Debbie does in the novel's closing pages before Martin finds her. Maybe -- maybe -- Ethan felt a twinge of remembrance of Martha Edwards, too, and could not stay under the same roof as an adult Debbie with that feeling in him. The way Le May subtly sets the stage for a quasi-incestuous union of Martin and Debbie makes such a reading of Ford's adaptation slightly more plausible. Alan Le May's The Searchers is a crisp read, largely free from purple prose. His sound ear for dialogue is honored by Nugent's echoing of almost entire paragraphs of dialogue from the novel -- though sometimes different people say the words. A well-known speech given to Olive Carey's Mrs. Jorgenson about the ordeals and resilience of Texans, for instance, was originally uttered by Amos Edwards, in an especially pensive mood, after he discovers (as we learn in retrospect) Lucy Edwards's body. For all his apparent disdain for Indian cultures, Le May doesn't write comic-book Indians; his Native characters always feel like distinct individuals within the parameters of unprincipled barbarism. The Searchers isn't the best western novel I've read -- that's still Oakley Hall's Warlock -- but I'd still recommend it. I'd even say it'd be worth someone's while to make another movie of it. It worked for True Grit, after all. Honestly, it'd be interesting to see the story shot from Martin's perspective as it is in the novel, and there are scenes in the book that Ford never filmed but are nevertheless potentially cinematic. Above all, there's an amazing scene in which Amos and Martin race for shelter as a blizzard bears down on them that was probably beyond Ford's resources but could certainly be done justice now -- probably only Akira Kurosawa could have done it justice in the past. But the point of a remake would not be to top John Ford, and I don't mean to imply that his Searchers inadequately represents the novel. In fact, it's an exemplary cinematic enhancement, a classic of creative adaptation. Ford and Nugent tighten the story effectively in many spots, reducing the number of visits to the Mathison/Jorgenson farm, for instance, to maximize the dramatic impact of each return. Since there's no time limit on reading a novel, Le May can take his time and work through more false leads than a movie audience might tolerate. He can't match Ford at his best for dramatic editing, ingenious framing of action, and the overwhelming power of those Monument Valley locations in VistaVision. Le May doesn't have Max Steiner's score to underline and highlight key moments, either; the veteran composer's old tricks work as well as ever here. Le May may be a formidable storyteller, but Ford is simply a better picture maker than Le May is a wordsmith. 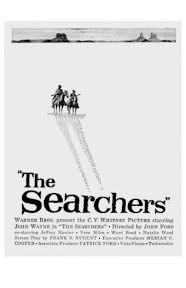 Many of the memorable words in the movie may be Le May's (though not "That'll be the day..."), but the indelible images of The Searchers, and the life they give to Ethan Edwards, are Ford's alone. His film may not be the greatest western (let me get back to you on that), and it may be too "Fordian" for its own good in some ways, but it is a masterpiece and would remain so no matter how many times the novel is filmed. What's new in Pittsburgh today? What you choose to see depends on your mood. Feeling serious? I've seen Clint Eastwood's version of the Ira Hayes story in Flags of Our Fathers, and that was pretty bleak -- but Hayes was only part of that story. A whole film about Hayes could be hard to take, but this is widely considered to be one of Tony Curtis's greatest roles. It's one of those movies I'm sure I saw when I was a kid, but I really remember nothing about it. Until it turns up again, here's the trailer, uploaded by skipjackturner. Feeling less serious? Feeling frisky, instead -- or maybe a wee bit avant-garde? Try this double-bill. Hollywood's Mexico -- not to mention the Mexico of Italy's spaghetti westerns -- is a projection of fantasies and impulses that would probably seem inappropriate or politically incorrect presented in a native context. Producer David O. Selznick and screenwriter Ben Hecht are up-front in declaring director Jack Conway's film a fantasy that has little to do with the recent history of Mexico. That could be a tip-off that it actually has something to do with the recent history of the United States, though not with Pancho Villa's relations with that country. You'll see nothing here about his raid across the border or the punitive American military expedition that failed to hunt Villa down. The U.S. comes into the picture only as Villa's home during a temporary exile. But the film was made for American audiences first, and my hunch is that, as a Pre-Code movie, Viva Villa! is saying something about America that couldn't be said -- especially at Irving Thalberg's M-G-M -- in an American setting. What seems to be said is something simple. In Hollywood's Mexico, for instance, it can be shown bluntly that the rich hate the poor, and that the poor hate them back. The Mexican elite (identified in the introductory titles as a holdover from Spanish rule) openly redistributes wealth upward, confiscating peon land and putting it in the hands of the wealthy. Those who complain, like Pancho Villa's father, are tortured and killed. Papa Villa specifically receives one hundred fatal lashes for asking only to keep a symbolic handful of earth after his land is confiscated. His body is left to rot as a warning to other dissidents, but his son flees into the wilderness and grows into Wallace Beery. In keeping with Beery's star persona, Pancho Villa is part monster, part overgrown kid. Beery's Villa is a ruthless avenger of the poor. Taking a town in the wake of a mass execution of peons, he stages a macabre trial of the regime's judges by dragging the fresh corpses into the courtroom to serve as their jury. He's really little more than a bandit until he meets Francisco Madero (Henry B. Walthall), a gentle visionary who hopes to build an egalitarian society founded on land reform. Villa is captivated by the vision, but disagrees with Madero on the means for realizing it. After Madero rebukes him for his latest atrocities, Villa patiently explains that revolutions can't be made entirely with love -- you need hate as well. He's willing to be the dark side of the revolution while Madero embodies the good side, but the implication is that Madero will be helpless without him. And so it proves, as crafty General Pascal (Joseph Schildkraut) plays the two against each other and exploits Villa's own excesses -- he robs a bank to get his own money out because he arrived minutes after closing -- to drive the bandit chief out of the country. Pascal promptly joins a coup against Madero to thwart his land-reform agenda, provoking Villa to return from exile and raise an army in record time. Without Madero's restraining example, Villa amps up the atrocities, earning him the scorn of the Castillos, Felipe (Donald Woods) and Teresa (Fay Wray) -- aristocrats who had supported Madero but recoil at Villa's methods. When Felipe calls him a beast, Villa answers, "Yes, the poor was always the beast, but now we're not afraid any more." Soon afterward, he tries to force himself on Teresa, who'd given him mixed signals earlier in the picture, and in the consequent melee one of his men shoots her to death. Felipe swears vengeance and fulfills his vow at the end, but not before Villa has avenged himself on Pascal, who had earlier forced him to beg on his knees for his life, by smearing him with honey and feeding him to ants, and pushed through Madero's land-reform legislation -- after which he retires to a short private life. Like its protagonist, Viva Villa! is a film of contradictory impulses. It's close kin to the dictator/mob rule/vigilante fantasies rampant on movie screens in 1933-4, from Gabriel Over the White House to This Day and Age and many others. But it's also a Wallace Beery star vehicle, if also the most ambitious of all such undertakings, and that requires Pancho Villa to be a sort of lovable oaf as well as a ruthless revolutionary realist. He's a man of appetites, especially sexual -- he aims to "marry" almost every woman he sees and he doesn't often take no for an answer. But there's still something childlike about him in a possibly reassuring way that conveys that he doesn't really mean any harm no matter how many people he kills. Embodied by Beery, he seems pretty obviously a fantasy of what Beery's target audience would do with absolute power. That comes with some condescension from the filmmakers, who have fun with Villa's failure to comprehend why the men who've printed 100,000,000 pesos of his inflationary currency refuse to be paid with those same bills. They also allow Villa to play the sort of sap Beery often portrayed. This comes through in his dealings with an American reporter (Stuart Erwin) who browbeats him into adopting risky tactics for assaulting a town because he'd wired home that Villa had already taken the town that exact way. This seems incredibly implausible even in a Hollywood fantasy, though it might have been more convincing had the more relentless motormouth Lee Tracy played the reporter as he'd been cast to do until he was expelled from Mexico, supposedly for urinating off a hotel balcony in an incident that also cost the picture its original director, Howard Hawks. The point, however, isn't so much that Villa is a sap but that he's suggestible, open to the influence of good people like Madero as well as mostly harmless hucksters like the reporter. Beery's Villa is not the uncompromising ideologue of counterrevolutionary nightmares, but a simpleton Cincinnatus, interested less in power than in crushing injustice by all means necessary. To their credit, the filmmakers end the film on an ambiguous and darkly humorous note as the mortally-wounded Villa asks his reporter friend what his last words were. The reporter suggests a final appeal for forgiveness, to which Villa responds, "What I done wrong?" And here's the trailer from the TCM website. Labels: 1930s, Mexico, pre-Code, U.S.
Stark entertainment choices face the Palm Beach moviegoer this weekend. First, perhaps as high a concept as you can possibly imagine: Gunga Din redone as a western, starring the Rat Pack. For all I know, the Jack Davis ad campaign is more entertaining than the actual film. Exhibitors could also run photo ads of Sinatra & Co. bounding about like idiots. Based on the trailer, which soapbxprod has uploaded to YouTube, the photo ads give a more accurate impression of the picture. Honestly, all Joey Bishop's shtick does is convince people that this is a lousy comedy. And we still have to take their word for it that the Indians are funny. If Sergeants 3 is too profane for your tastes, there's always this. Did you see what they did there? St. Francis is a rebel with a cause. Like this is some sort of a youth movie. Crazy, man. Now dig the trailer. And what do you know? That pitch sure sounds like a lot of hype, but Dolores Hart does seem actually to have been inspired by her role. As many people found out around Academy Award time, she became a nun in real life and remains one today. If that kills you buzz, here's Claudia Cardinale opening in Milwaukee. La Ragazza con la Valigia is a film from the director of Black Jesus, who seems on more comfortable ground here. Couldn't find a trailer in any langauge, but clips abound online. Here's one that shows off the star and some early Italian rock 'n roll. onironauta666 uploaded it. The Ruffians is Maurice Labro's Les Canailles, starring ex-spouses Marina Vlady and Robert Hossein. It's obscure enough today in the Anglophone world that it doesn't even have a rating at IMDB. Hossein went on to star and direct in the outstanding spaghetti western Cemetery Without Crosses, while Vlady would act for both Godard and Welles after winning an acting prize at Cannes. American distributors used to make an effort promoting new international stars. I wonder whether either of these films would play even in an arthouse today. It's pretty hot today where I am, but imagine how hot it was fifty years ago today in Altus, OK. So how does that happen? The trailer for this British sci-fi may clue us in, thanks to Classic Movie Trailers. And here's more British sci-fi, of a sort, opening in Lawrence KS. No trailer online for this 1960 comedy,nor for the American service-comedy co-feature, alas. Louis Prima isn't my first idea of a Twist artist, but he's the producer so what he says goes. On the opposite of a lighter note, William Wyler's remake of his own 1936 picture These Three opens nationally this week. Here's an ad from Miami. What's this "too evil to be false" accusation? Hint: It's the charge made in the original play by Lillian Hellman but not the charge made in These Three's bowdlerized version. And if there were such people as fanfiction writers in 1962, they'd have a field day with this one. But to give Wyler credit, this is definitely an interesting choice to follow up Ben-Hur with. And maybe if you watch the trailer uploaded by Hippiemans you'll figure out the "mature nature of its theme." Finally for today, because I so love the artwork,another manifestation of The Head, this time in Spartanburgh SC. Just be sure to read the fine print before going to the drive-in. The problem with Men Must Fight is that it takes a slow-burn approach to its subject within the framework of a drawing-room melodrama about a husband, a wife and a son. It starts in 1918 with an American flier (Robert Young) and his nurse girlfriend (Diana Wynyard) on the Western Front. There's another man, older and an officer, Ned Seward (Lewis Stone), but he knows when he's beat. But there's hope yet for him, for few characters in films have been so obviously doomed as Young's airman. When Laura, the nurse, pins her four-leaf clover on his uniform before a mission, it may as well be a nail through the lid of his coffin. As it turns out, he survives the crash but dies not long afterward. He's left something of himself behind, however, and for that reason Laura is reluctant to return to America when the war ends. That's when Seward, scion of an aristocratic line, chivalrously steps in to make an honest woman of Laura. Twenty-two years later, Ned Seward is Secretary of State and Laura Seward is one of the country's leading peace advocates. They've worked in tandem, Ned having negotiated a major peace treaty with Eurasia, the other great power of 1940, and their son Bob (Phillips Holmes) has an irreverent attitude toward old-school patriotism that gets him in trouble with his girlfriend Peggy (Ruth Selwyn) and her mother. Bob had the gall to criticize a crowd that nearly lynched a "Bolshevik" who'd desecrated an American flag. It's a minor incident, but suddenly things don't seem quite so peaceful. And not long after, Ned takes a phone call from Washington and has to take a quick flight there. Things are falling apart fast after the assassination of the American ambassador to Eurasia -- it's an insult the nation will not tolerate. A show of force must be made for the sake of national honor. Ned insists on this, but Laura sticks to her pacifist guns. She organizes a peace rally that's televised across the country -- remember, this is 1940 -- in which she delivers a Lysistrata ultimatum, threatening a global birth strike if men won't renounce war. Her speech enrages a group of pool-playing louts watching at a nearby bar. They storm the coliseum where she's speaking, but a Secret Service detail gets her out safely. A crowd gathers outside the Seward home, but Ned calms them with his assurance that his own son will serve and sacrifice if war makes it necessary. But he didn't consult Bob before saying that, and Bob's having none of it. A nonviolent war of wills breaks out that climaxes with Ned's revelation that Bob is no Seward and, on top of that, unworthy of the honorable name. There's an extra edge to the three-way family conflict that emerges when Ned accuses Laura of raising Bob to hate war mainly because Bob's all she has left of her true love. Looked at from another angle, it's almost as if Ned is pushing for war in order to eliminate the symbol of his secret inadequacy as a lover. It's melodramatic in a hokey way, but it's also a little chilling. And the war came. From all reports, our boys are getting their asses kicked by the Eurasians, who appear capable of projecting force across the Atlantic to take the Panama Canal and, need I add, bomb New York City. The bombing scene only lasts a couple of minutes, and the M-G-M special effects team isn't quite of RKO caliber, but the audacity of the vision, as giant facades come crashing down to street level, still impresses. Despite the high-profile hits, the city isn't really that much worse for wear, from appearances, and Laura Seward and Peggy manage to escape even though their car is caught in the middle of the bombing. Still, Laura's injuries are enough to turn the tide for Bob. Against her wishes, he enlists. Against Ned's wishes, he doesn't join the chemical corps, as he'd wanted, but the air corps, where he'll be on the front line of fighting. From what Ned has told us about whole air fleets being wiped out by poison-gas projectiles, Bob has probably doomed himself. He hasn't exactly come to love war, either. It's still a "dirty, stupid business" to him, but he explains the title of the play (which M-G-M considered changing to What Women Give Up) by saying, more or less, that a man's gotta do what a man's gotta do. The film closes with an impressive shot of a massive American formation flying over the city as three generations of women -- Peggy, Laura and Ned's mother (May Robson) watch with disgust from a balcony. The old lady has grown more convinced that women ought to rule the world, and Peggy now takes Laura's side, vowing never to let any son she has by Bob go to war, but all three seem resigned to things changing very little in the future. The relatively sedate build-up to mayhem -- including a steamship scene with cameo by drunken master Arthur Housman -- who claims that Europeans don't appreciate alcohol because they never had to do without it like Americans had, has probably hurt the reputation of Men Must Fight more than anything else. For an impatient viewer, the first 40 minutes or so, at least until the riot at the Coliseum, will be like sitting through the romantic scenes in Marx Brothers films. It doesn't help that the film lacks especially charismatic actors, though Stone makes the most of his bleakly authoritarian Pre-Code persona. But these faults don't explain why Men Must Fight doesn't endure with genre fans for whom the bombing sequence should stand as some sort of cinematic milestone. I see two likely reasons for its neglect. First, while it can be called a science-fiction film for predicting the near future, it doesn't project far enough to remain relevant, compared to H. G. Wells's Things to Come, which resembles Men Must Fight for its first reel but then keeps pushing decades ahead. Second, and maybe more importantly, Men Must Fight envisions a future war but isn't really an anti-war movie. It isn't a pro-war movie, either. Its tone is ambivalent; its title is declarative rather than imperative; its attitude toward war is resignation rather than denunciation. The playwrights and adapters seem honestly to have aimed for balance, for letting both sides have their say and making their best arguments. It can't help but appear to equivocate on the crucial question of the age, and however honest or objective its equivocation, it can't help but damn the film for many viewers. But it's still a cinematic milestone, as far as I can tell, and an interesting study of attitudes toward war when the buildup to the real Second World War, which arrived a year ahead of schedule, had only just begun. Spencer Tracy paid his dues for five years in Hollywood before becoming a real movie star. He served that time under contract to Fox Film, which had little idea of what to do with him. He usually starred, but his starring roles were usually unmemorable, with a few exceptions that people have probably read about more than they've seen. Like many a contract player, he got loaned to other studios. Warner Bros. wanted him for Michael Curtiz's film version of a best-selling memoir by the warden of Sing Sing prison, partly because James Cagney was unavailable, but also most likely because Tracy had made his name on Broadway playing a tough convict in the play The Last Mile. So 20,000 Years in Sing Sing finds Tracy at a midpoint between his Broadway fame and his real movie breakthrough, since some of his performance for Curtiz anticipates his role in his first hit for M-G-M, Fritz Lang's Fury. It seems unlikely that the screenplay was based on actual episodes from Lewis E. Lawes's memoir, though the story presumably exploits some of Lawes's controversial policies. Lawes himself is fictionalized into a Paul Long (Arthur Byron), who takes special interest in one of his new prisoners, Tommy Connors (Tracy), after Joe Finn (Louis Calhern), a "deputy boss" for the local political machine urges Long to make things easy for Connors, who has unexplained political connections. The incorruptible Long throws Finn out and decides to make an example of Connors instead. Connors takes his pull for granted until he's assigned a ridiculously oversized uniform and punches an unsympathetic guard. Long orders him sent to solitary until he accepts his uniform, then gets a better idea. He has the guards tell Connors that he can go without the uniform if he wants, but he wont get another. That means he has to parade around everywhere in his equally oversized union suit -- one con says it looks like he has a stash of tools in the bottom of his drawers. Connors remains defiant until he's assigned to work in the icehouse. He then reports to Long in the uniform he tore up, but tells the warden he won't work and never has. Long's answer is to keep him in solitary until he begs to work. After three months -- it seems like three years to him -- Connors cracks and is soon breaking rocks with gusto. Cons at Sing Sing are given intelligence tests to determine their regular work details. Connors proves nearly as bright as Bud Saunders (Lyle Talbot), a genius criminal with Phi Beta Kappa credentials if not a criminal genius, and both get easy details, while Hype (Warren Hymer) proves so stupid that he's only fit for lavatory detail, Connors's smarts come through again when his girlfriend Fay (Bette Davis) explains her harebrained scheme to seduce Joe Finn into working for Tommy's early release. Tommy warns her that she's playing with fire, since any hint she gives Joe will only give Finn reason to make sure Tommy stays in jail, or never comes out. Ironically, however, it's not his brains but his criminal superstition that stops him from joining Saunders's escape scheme, for which the genius has secretly built a lockpicking machine and assembled a working pistol.Connors meant to join him and Hype, but the escape takes place on a Saturday, Tommy's unlucky day. Not so unlucky this time; while Tommy sits in his cell, Hype and another con are caught when the lockpicker malfunctions, and Saunders jumps to his death after killing two guards for whom his accomplices will burn in the electric chair. Even though Connors retains his bluster and tells the warden the truth about superstition alone preventing his escape, Long becomes convinced that Tommy's intelligence and honesty make him trustworthy. The test comes when a telegram reports that Fay has been gravely injured in a car accident. Heretofore Long has been shown breaking the will of his charges. Now we see the other side of his penology, the honor system that entitles trustworthy inmates to leave prison for short unsupervised trips. Long arranges for Tommy to see Fay, who's being treated at home, and Tommy promises to return, even if it should mean the electric chair. All seems well, but Tommy notices that it's another Saturday. In the city, trailed by a suddenly suspicious NYC cop who'd brought him to Sing Sing initially, Tommy visits Fay and figures out the truth. She'd foolishly kept on trying to butter up Joe Finn, but drew the line too late and ended up either jumping or getting thrown from a moving car. Joe conveniently arrives as Tommy hides and the cop watches, to offer Fay hush money. Tommy confronts him and fights him. Just as Joe raises a chair to brain Tommy, Fay shoots him from her bed. Both realize that Tommy will be blamed, and the cop is breaking the door down, so Fay gives Tommy the hush money and urges him out by the fire escape. Of course the cops don't believe Fay's story and the headlines scream that a furloughed criminal has committed murder. The news media crucifies Warden Long, who drafts a resignation letter and has just begun to sign it when Tommy, last seen in a safe house waiting to board a tramp steamer, appears to prove his word and vindicate the warden. This is the part that anticipates Fury, where the big question is whether and when the Tracy character will step up, do the right thing and save men from death for a murder they didn't commit -- Tracy's. But Fury's is a happy ending compared to 20,000 Years. Tommy Connors confesses to the shooting of Joe Finn, and Fay is incapable, due to questionable credibility, of convincing jurors of the truth. That means death for Tommy -- and in the unflinching fashion Warner Bros was capable of almost uniquely among Pre-Code studios, there will be no pardon or reprieve. Instead, Tommy convinces Fay that telling the truth won't help them, since they would still be separated for decades if Tommy serves his original term and Fay goes to jail. "We can never be together" he explains, combining an older pathos of renunciation with the Warner hard-boiled manner. The real Warden Lawes seems like a real self-promoter -- note how he's billed above the stars of the picture. He welcomed Curtiz to Sing Sing to give many scenes documentary authenticity. The director's dynamic framing of action and sharp, shadowy cinematography by Barney McGill ensure a smooth fit between location and studio scenes. Tracy and Davis, in their only screen pairing (before it would have been a major event) have convincing chemistry, and the Warner players are their usual stalwart selves. This could be Arthur Byron's best ever showcase; he holds his own with Tracy every time and his understated authority grounds a sometimes questionable storyline. Lawes/Long is an interesting movie subject at a moment when many Americans seriously considered the necessity of dictatorship. Many of the movie warden's comments are double-edged, especially his assertion that only in prison, under his supervision, are all men truly equal. The warden might and probably would be handled differently in other eras, but the film we have reflects the Pre-Code era's paradoxical longing for authority in a way that may make it uncomfortable viewing today. But without reading politics into it, it remains a brisk, forceful film and an early hint of what Spencer Tracy was capable of and would achieve later. Here's what looks (or sounds) like a British trailer for the picture, uploaded by omemeister. Labels: 1930s, pre-Code, prison movie, U.S., Warner Bros. In the Coen Brothers' Barton Fink, a pretentious playwright is lured to Hollywood and tasked with making a "Wallace Beery wrestling picture." If you believe the Coens -- and that's a big if sometimes -- they didn't know at the time they wrote their picture that there was such a thing as a Wallace Beery wrestling picture. Yet to someone at M-G-M in 1932, it may have seemed natural to follow up Beery's big success in a boxing picture -- he won an Oscar for The Champ -- with a film about wrestling. But the natural-seeming follow-up doesn't follow The Champ's formula -- Jackie Cooper is conspicuously absent, as is any hint of father-son pathos. Instead, Flesh is much more of a true Pre-Code movie, at least on paper -- and can you beat that title? Actually, in retrospect, Metro should have thought twice about it. No matter how beloved Beery had become, I can only imagine that advertising a film called Flesh on the understanding that most of the title substance on display would belong to Beery might have sent even his most devoted fans in headlong flight from the nearest theater showing the picture. That title isn't the only thing not quite right about the project. This is an M-G-M picture directed by John Ford during a period when Fox let him work for other studios -- Air Mail for Universal, Arrowsmith for Samuel Goldwyn, etc. It is, in fact a "John Ford Production," but Ford refused to take credit for directing. That is, he repudiated a picture that still bears his name. But I can't blame him. Flesh is one of those rare occasions -- the silent Four Sons is another -- when he indulges a certain Germania-mania. His is a vaudeville Germany where the natives sometimes speak their local lingo and sometimes speak English -- to each other. Ford never figured out a neat Judgment at Nuremberg type trick to transition us from German to English. They just start out auf Deutsch, vacillate a while, then stick to comic-strip dialect. In this milieu flourishes the great Polokai (Beery), king of the beer-hall wrestlers like Hitler was king of the beer-hall orators. But Polokai is more than a wrestler -- he's a wrestling waiter. He'll bring the beer barrel to your table to fill your mug. But he is mighty without being a brute -- he's shy, unworldly and simple -- Ford seems to suggest that the last is a national trait. In short, he's a sap. Or as one of the ads says of Beery, "The Champ becomes the Chump!" Polokai proves easily manipulated by a pregnant expatriate American ex-con (Karen Moley) who's been ditched by her boyfriend/baby-daddy and needs money to get back home. When the boyfriend (Ricardo Cortez) finally appears, he pretends to be the woman's brother because he sees an angle to exploit Polokai, who has become the German wrestling champion, and sees a better chance for himself if Polokai keeps his romantic hopes up. Polokai's own plan has been to follow his emigrating employers to America, where they intend to open a biergarten in spite of Prohibtion. Now the Cortez character (a smooth-talking sleazebag, as usual) figures to promote Polokai in the big-time world of American professional wrestling. He explains the title by declaring his intention to make millions pushing "a hunk of flesh." Ford and his writers (reportedly including William Faulkner -- do the Coens really want us to believe they never heard of this?) don't have the surest grip on what wrestling was about at this point. They seem to understand that wrestling was what wrestlers call a work, but they seem to see this as the moral equivalent of fixed fights in boxing. That is, when Cortez suggests that it's sometimes the smart thing to lose instead of win, he seems to mean that Polokai should take a dive at some moment of his choosing, as a corrupt boxer might. Of course, German wrestling is totally real -- a shoot, as they say, so Polokai's honor is offended by the suggestion that he lose on purpose. His career is stalled a little by rigged decisions after time-limit matches, but he finally gets a title shot. As his career approaches its peak, his life falls apart as he discovers the truth about the sleazy Cortez and the repentant Morley and kills Cortez with his bare hands for hitting Morley. He proceeds to the arena and wins two of three falls before turning himself over to the police. There remains a tearjerker moment during visiting hours when Morley finally admits her love, for all the good it'll do Polokai in stir. There's little Fordian about this picture, though the director does manage to hustle Ward Bond on screen for a minute or so as a wrestler. The ethnic aspect enables Ford's worst impulses, and the comedy in general is stupid. Typical is the German championship bout, where Polokai seems to be losing until he hears that the Morley character has given birth, at which point, after having chatted inanely with his corner men while suffering in a leglock, he promptly squashes his foe so he can get to the hospital. The one time I laughed out loud was when Polokai was learning English out of a phrase book, reading aloud, "That is a warm donut. Step on it." A glimmer of redeeming absurdity in a leaden melodrama. This is the part where I usually say that some film in the Pre-Code Parade is of interest as a historical document, at the very least, but Flesh is less than even that. It's probably one of the most forgettable items in both Ford and Beery's filmographies, and as such it does teach a historical lesson or two. First, not every great director flourished under Pre-Code conditions; 1929-34 was not a peak period for John Ford. Second, and corollary: Pre-Code didn't prevent anyone from making crap -- here's proof. Maybe the exhibitor knows his audience. But today's audience might not recognize the main attraction at first glance. This Roy Boulting film is best known under its original British title, A French Mistress, and IMDB is unaware of the "French Teacher" alternate title. Takethetube9010 has uploaded something that looks like a trailer and opening credits sequence all in one, along with stills from the picture. But what about Breathless? Well, the trailer may as well be in a foreign language. Actually, it is in a foreign language, but that's not what I mean. Here's a hint at the powerful sordid realism to come in the original Francophone trailer, uploaded by jarvinho. The beauty of the system, of course, is that whether you wanted powerful sordid realism or pert raffishness, you were getting it that night -- or so they promised. The original movie was an early showcase for Rudolph Valentino. The remake is a showcase for Glenn Ford. Make of that what you will;maybe the trailer (courtesy of TCM) will help. Sometimes a movie wants to be one thing and ends up another. The English-language title of Kihachi Okamoto's docudrama seems to faithfully represent the director and writer Shinobu Hashimoto's intention to emulate The Longest Day, the sprawling all-star international D-Day epic from 1962. For Japan, however, the longest day doesn't see a big battle or even an American bombing raid. After about 20 minutes of barely-dramatized exposition (narrated by Tatsuya Nakadai in a grave waste of a great actor), the film focuses on the 24 hours leading up to the August 15, 1945 radio broadcast by Hirohito, the Showa Emperor, announcing Japan's surrender to the Allies. With The Longest Day's international scope impossible for him, Okamoto juggles a number of plot threads to make room for a huge cast, this being a Toho showcase celebrating the studio's 35th anniversary. The points of interest are the characters' varying reactions to Japan's unprecedented admission of defeat in war, with the most attention going to those desperate and despairing dead-enders who want to stop the broadcast and topple the civilian government in order to keep the war going. As officers of the Imperial Guard kill their commanding officer and attempt to seize control of the Imperial Palace, and while a rogue military unit attacks the prime minister's house, the warmongering madness and the race-against-time format become less reminiscent of any other World War II film and more reminiscent of those doomsday twins of 1964, Stanley Kubrick's Dr. Strangelove and Sidney Lumet's Fail-Safe. But while those movies milked futile attempts to avert Armageddon for maximum suspense -- the Kubrick almost in spite of itself -- Japan's Longest Day gets its paradoxical suspense -- it works as a thriller despite our knowing that the conspirators must fail -- out of desperate efforts, in the wake of Armageddon, to keep it going. If you can get past those first turgid reels, Okamoto comes up with an effective historical thriller. Despite the initial evidence, he proves quite capable of manipulating time as the government dithers over the text of the Imperial Rescript the Emperor must read and the propriety of the Emperor speaking into a microphone while the madmen plot their mayhem. Anchoring the picture, predictably enough, is Toshiro Mifune as War Minister Anami. This character serves more or less as the film's moral compass. A superpatriot, he's initially reluctant to surrender. He believes, almost insanely, that Japan shouldn't consider itself beaten until the Allies invade and a major land battle decides the issue. He stuns fellow Cabinet members with the assertion that Japan has been handicapped by having to fight on small islands where its full military might couldn't be brought to bear. His personal belief is that the millions who've already died will have done so in vain if Japan doesn't fight to the bitter end. In short, he thinks much like the maniacs who try to prevent the surrender, except for one thing. His values are grounded in obedience, like any good soldier's, and when the Emperor speaks and says the war is over, it's over as far as Anami is concerned -- end of discussion, that's an order. If he feels he still has a debt to the dead, or to the Emperor he feels he failed, his proper recourse is seppuku. Those who throw tantrums and otherwise act out, assuming that the Emperor has been tricked and the country stabbed in the back, are forgetting something important. They're putting their own personal feelings and prejudices before the word of the ruler and the good of the country. Anami is no hero -- he does nothing to suppress the uprisings, leaving that to others -- but his personal example is damning to the conspirators. 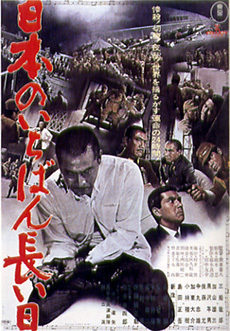 Mifune's performance is of a quality out of proportion to the commercial ambitions of this all-star studio project. But the ensemble acting is really good all around here, and the crosscut action has a thematic coherence that makes the finished product much better than the first twenty minutes would leave you fearing. When a historical picture can make you feel suspense the way this one does -- it does probably help if the audience doesn't know Japanese history that well -- it's a praiseworthy accomplishment. But even if you know the general history you may not know what happened to particular people, and the cast here is good enough to keep you interested in their several fates, while our sense of the stakes makes the plight of even minor characters like a radio announcer suddenly important. When the announcer faces down a gun-toting soldier who demands to read a speech condemning the Rescript in advance, you feel that it's not only the climax of the film but a fateful moment in history. With the suspense comes some cathartically violent moments. The death of the Imperial Guard commander is preceded by a close-up decapitation, and Anami's suicide, seconded by himself with a slice to the jugular, is hardly less gruesome in black and white than it would have been in color. These scenes may be tough to watch, but they bring the war home to the last privileged quarters of Japan and remind us more effectively than any stock footage that this is still a war movie. This is a stern film with a strong message. If it resembles a nuclear nightmare more than a classical battle, it at least gives a hopeful account of people with the courage to step back from Armageddon at the last possible moment. Remember Satan Never Sleeps from a few days ago? I mentioned that exhibitors had a choice between soft-sell and hard-sell campaigns for Leo McCarey's swan song, depending on whether they wanted to promote feel-good inspiration or Commie atrocities. The Embassy theater in Reading PA opted for atrocity. Local exhibitors knew their audiences, presumably. Some could presume that their regular patrons didn't care for political movies -- those places would opt for the soft sell. Others figured that politics might not draw, but violence would. Thus the Embassy. Apart from the first-run films you might see advertised on TV or the big general-interest magazines, it was often hard to tell from a newspaper ad how old a movie was. Can you guess anything from this ad in a Pittsburgh paper? Back Streets of Paris was actually made back in 1946 and had first played the U.S. in 1948. Oddly, the management of the Art Cinema didn't think to mention that it featured recent Oscar winner Simone Signoret in an early role -- I believe that's her in the ad art. But maybe an Oscar pedigree would turn off the Art Cinema's target "mature adults" audience -- "Art" was already virtually synonymous with sleaze in some places. If memory serves, we've encountered the 1958 German film Das Maedchen Rosemarie already -- and we'll most likely encounter it again.